Seed tape is a great product for planting your garden that has seeds embedded right into it. It’s perfect for planting tiny seeds like carrot that are difficult to space in the garden. The “tape” is made of bio-degradable paper which is planted directly into your garden. I love using seed tape, although it tends to be pricey. 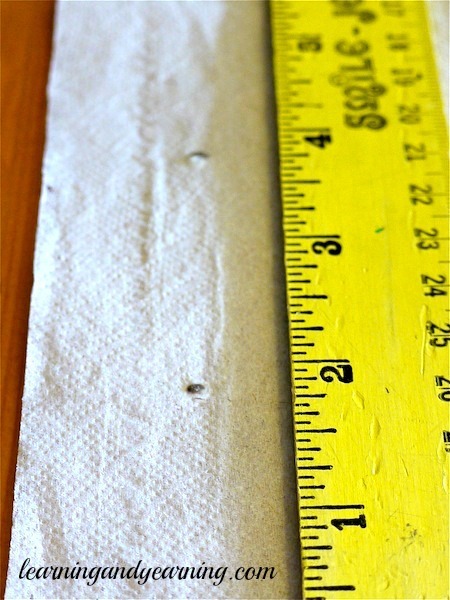 But you can make your own seed tape for a fraction of the cost of pre-made tape. Seed tape has several advantages. No seed is wasted; the seeds are embedded into the paper tape one at a time and are perfectly spaced and ready to go into the garden. This also means that no thinning is required. They are especially useful for tiny seeds which can be difficult to plant such as radish, carrot, lettuce or parsnip. 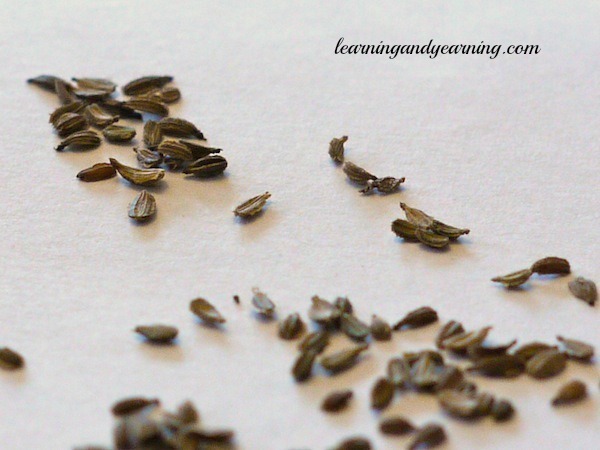 Carrot seeds are tiny and can be difficult to plant. 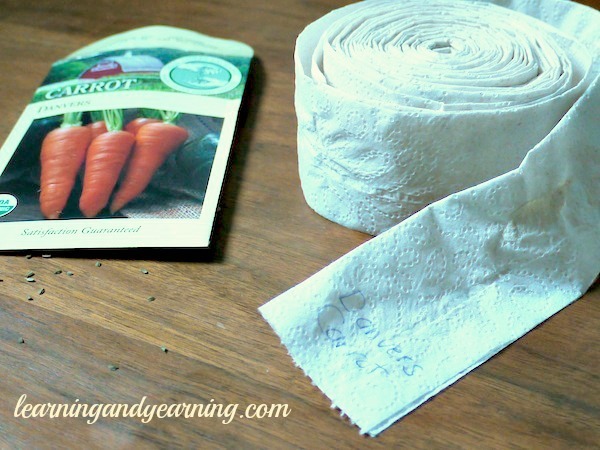 I used unbleached toilet paper (like this) to make my seed tape. I think that paper towels or even newsprint would work as well, although I haven’t tried them. Begin by mixing approximately 2 tablespoons of white flour with 1 tablespoon of water to make a thick paste. This will act as the glue to hold the seed in place. You don’t want this to be watery and thin because you want it to dry quickly so that the seed does not have a chance to absorb the water. Unroll the toilet paper until several feet of it are lying flat on the table in front of you. Fold the toilet paper in half the long way, and then unfold. You will be placing the seed in the middle of one half of the toilet paper (about 1″ from the edge of the toilet paper). From the seed packet, determine how far apart you need to space your seeds. Don’t use the distance given on the packet for planting – use the distance that the packet suggests for thinning. For carrots, I placed my seeds 2″ apart. Use a ruler to guide you as you space seeds. 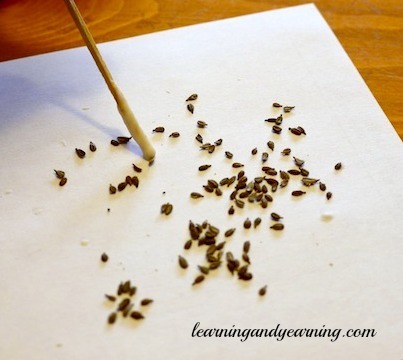 Spread your seeds out onto a piece of paper. If it helps, you can use a pen or marker to mark the spot on the toilet paper where the seed will go. I did not do this. Now, dip a tooth pick into the flour paste to get a small amount of paste on its tip. Use this to pick up just one seed. Using a ruler as a guide, place the seed onto the toilet paper at the proper distance apart for the seed you are working with. When you’ve “planted” several feet of toilet paper, add a few dots of your flour paste every few inches near the edge of the toilet paper and fold the toilet paper back in half. Rub gently to allow the paste to glue the two sides of toilet paper together. Continue working in the same manner until you’ve used all your seeds, or until you’ve made as much seed tape as you require. Be sure to leave the toilet paper spread out until the paste is completely dry. Write the name of the seed on one end of your seed tape, and then you can roll it up and store in a cool, dry spot until you’re ready to plant. When I’m ready to plant my seeds, I unroll the seed tape and cut it to whatever length I need for the area I am planting in my lasagna garden. Place the tape on the soil, and cover it with the amount of soil that the seed packet recommends for planting depth. For carrots, that’s about 1/4″. For best results, be sure to keep the seed consistently moist. Remember, the paper will absorb water, so your seed may need extra water. 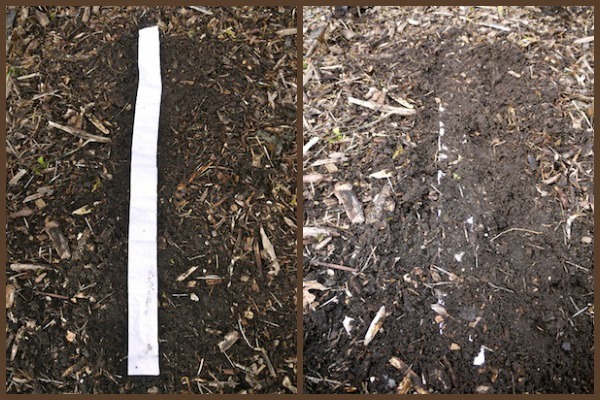 Lay the seed tape in your garden (l), and cover with soil (r). Keep seeds moist until germination. After you plant your carrots, you may want to follow the tip that Kris from Attainable Sustainable learned from her grandfather. It’s new for me, and I’ll definitely be trying it this year! You’re welcome; thanks for stopping by!! I absolutely love this! Can’t wait to try it!! Actually, here in Mid-Missouri, we have had our usual crazy Spring. Very warm and nice for a week or so…I planted carrots and two days later we got a three-day “Frog-strangler” as we call them! Had around 6 inches of rain that came down very fast and hard. My garden soil is washed badly so it will be at least a week or two before I can determine if my little carrots made it or got washed away. I think I may go out (soon as it dries out a bit) and take my toilet paper to the garden! Thanks! Hay or straw cover about six inches laid loosely should minimize soil compaction due to rain. Here in ‘South Missippi’, we can get unexpected torrential rains at any time. Last year I used a hay cover on my garden, and will do so again this year. The soil remained loose and the planting ridges didn’t wash down during even the longest driving rains. The sprouts, given time, will pop right up thru the hay cover. Some other benefits are that hay cover tempers the soil against excessive heat (zones 8/9, where I’m located); and acts as a buffer for fertilizer side dressing, preventing root burn. Just be sure to use spoiled (year old) hay that has started to decompose. It will contain less noxious weeds and seeds than fresh bails of hay. I avoid using pine straw because of sap residue. Altho pine straw is generally seed free, the sap residue isn’t very good for your plants. This is so cool! My carrots are always such a mess but I have a vision of this cleaning them up and making sure they get into nice, tidy rows!! 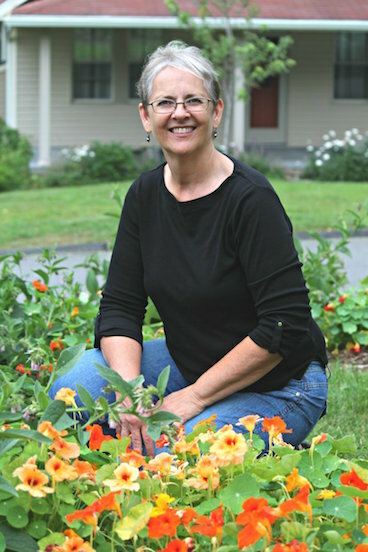 Thank you for linking this to Green Thumb Thursday – please stop by again tomorrow! Would you recommend adding a spray of liquid plant fertilizer or something similar? Well, no, at least not until the carrots are 3″ high. But if you’ve built your soil with compost and organic matter, fertilizer shouldn’t be needed at all. If you do decide to fertilize, be sure to use a low nitrogen fertilizer, as nitrogen will give you lots of green tops, rather than large roots. Good logical advice. Last year I made that mistake – too much nitrogen. A combination of that and the summer heat cause everything to bolt straight to seed. Narry fruit one! Sure wish I’d’ve used 8-8-8 instead. 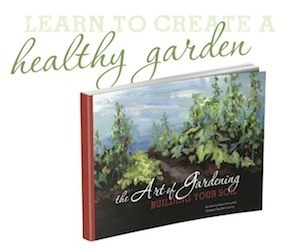 Oh well – that’s why I call myself the Haphazard Gardener; everything I do in my garden is an ongoing learning experience. And I make lots of mistakes along the way. But I enjoy gardening and sharing the experience. Good fortune! Why stop at carrots?? Red Beets, Turnips and others. Do it now during the winter and come spring it will make planting go quicker. We are trying this for our carrot seeds this year. We followed the instructions and planted them the day after making them. It was about 160 feet all together. Saved us a lot of time in the garden. But…it has been 26 days now…and nothing is happening. We have had plenty of rain, and we have watered when needed. Should we be concerned at this point? We have always grown carrots with no trouble, but we are wondering if we need to get out there and replant. They should have sprouted days ago. Hi Michelle, unless your weather has been unusually cool, your seeds should have sprouted by now. It’s hard to say what has gone wrong, but yes, I would replant. I am going to try this with herb seeds too…many which are very tiny. I thought carrots need light to germinate? I’m curious about your source for that, Anna. I’ve found that consistent moisture is essential, but not light. will the carrots sprout through the top layer of the toilet tissue (if I’m interpreting the directions correctly). . .hope you answer soon. . .they are ready and waiting to be planted. Yes, they will! Be sure to keep the paper and soil consistently moist. Last year I had horrible results in my garden because of, I believe, wrong spacing which caused overcrowding. I avoid thinning because it tends to disturb the tender roots of neighboring plants and also seems to be a waste of good seed, just to sow then rip up the sprout. So with the advice given in this article, and others, I’m going to try Seed Tape this year. The only thing I plan to do different is to place two seeds in each spot along the paper. I was taught at a young age to sow seeds in pairs because in nature, seeds germinate better in pairs. One overpowers the other resulting in self-thinning. And if both should germinate, overcrowding isn’t an issue since the two will intertwine to become one. I tested this approach on a previous garden and it works well. While this may make for strange looking plants, it works well. may I use white school glue instead of the flour paste? I’ve never tried white glue, JoAnn, but I think it should be just fine. I have planted carrots 2 ways. 1. I usually make a wide row (2 feet perhaps). Soil smooth and fine. Scatter the seed almost like grass and GENTLY rake in. You don’t want the seed to go too deep. Yes I did a lot of thinning. I would sprinkle a 1 inch layer of fresh mowed grass clippings, then water the patch with a gentle spray. This settles the clippings into a cover that the wind won’t blow away. I gently water every other day, more or less depending on weather. Carrots take a while and it might be 2 weeks before you see “grass” poking through the grass mat. Both are great ideas, Mark; thank you! Using a toothpick with paste to pick up the seeds is absolutely brilliant. I created a seed tape last year and adding the seeds by hand was frustrating. This year, it was a breeze. Thanks for the great advice. Happy to help, Michel. Glad you stopped by!